March 1, 2010  The latest album by Blur frontman Damon Albarn and comic-book artist Jamie Hewlett is yet another well-crafted and dance-friendly set of glitchy club beats and hip-hop grooves. 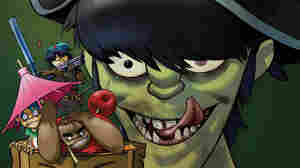 June 28, 2005  In its videos and promotional art, Gorillaz is a band of cartoon characters. In real life, the music is the work of Damon Albarn, who is also part of the real-life British band Blur. Albarn has just released a second Gorillaz album, Demon Days. Tom Moon has a review. April 6, 2005  Bob Boilen speaks with All Things Considered music reviewers Tom Moon, Meredith Ochs and Will Hermes with guest Joe Levy, managing deputy editor at Rolling Stone about the most anticipated releases. April 2, 2002  The Gorillaz' debut album sold more than 6 million copies worldwide, and the group was nominated for MTV awards, Brit awards, even a Grammy. Their recent tour sold out premier venues in North America. Not bad for a bunch of cartoon characters. NPR's Susan Stone goes behind the curtain, Tuesday on All Things Considered.